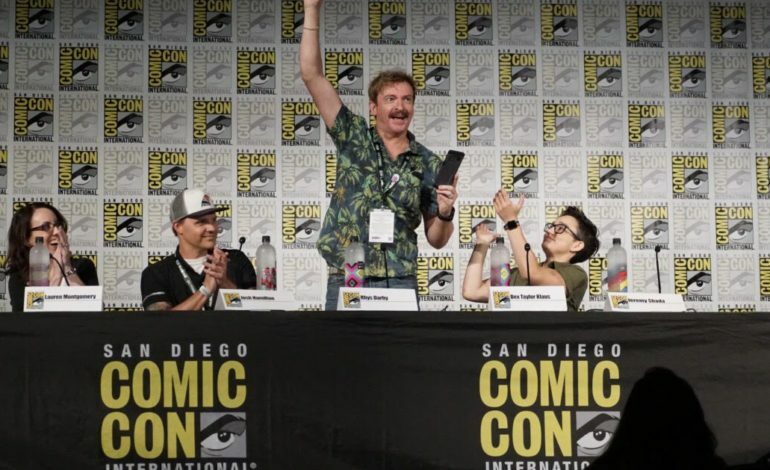 At a packed panel at Comic Con this morning the Netflix cartoon reboot of Voltron (called Voltron: Legendary Defender) a massive crowd of fans were delighted with several pieces of news. Chief among them, one of the show’s lead characters Shiro is gay. Without going into too many specifics, the creators and cast on hand premiered the first episode of season seven at the panel. In it, a plot line is revealed to show Shiro’s one-time boyfriend far back when he first met character Keith. The crowd shrieked with joy when they realized that the relationship the show was showing was in fact an actual relationship. The creators didn’t expand too much on the reasoning, but the crowd seemed thrilled at the move for inclusion. While not the very first LGBT character in children’s cartoons, it’s a super rare occurrence. If love and relationships are at all depicted in kid’s cartoons, it’s typically only straight relationships depicted. Cast member Rhys Darby was a laugh-a-minute bubbling pot of hilarity. Nearly every time he opened his mouth the whole crowd roared with laughter. He quipped at the beginning of the panel looking at the video walls flanking the stage, “We don’t have screens like that in New Zealand.” He also spent a great deal of time taking live videos from the panel of himself, his fellow cast members and the crowd (presumably for Instagram), mugging with a giant smile all the while. Executive Producer Joaquim Dos Santos stated happily that if there ever was a live-action Voltron movie made, Darby would have to be in it. In other news, the show will be returning to 13 episode seasons. The bad news is though, that Executive Producer Lauren Montgomery explained that the following season, season seven, would be the finale of the series. That means just 26 episodes remain before no more Voltron, again. Season seven of Voltron Legendary Defender premieres on Netflix August 10th.